The Cuisinart FP-12BKN is an elite collection™ 12-cup food processor which is a machine of ground breaking performance and durability. It is ideal for fine chopping, kneading, shredding, mixing and slicing. The food processor features 6-position slicing disc and reversible shredding disc, small adjustable slicing and medium reversible shredding stainless steel discs and dough blades. The Cuisinart Food processor has many exciting features for users of all types. You can extend the lifetime of your Cuisinart Food processor with the purchase of a FactoryOutletStore Factory Protection Plan. 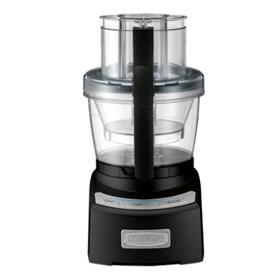 The Cuisinart Food processor is sold as a Brand New Unopened Item.